By presenting speed, energy vector, power, altitude and navigational information on a clear screen directly in front of the window at eye level, head-up guidance systems help keep the pilot's eyes looking out of the cockpit. This aids the pilot's situational awareness and improves safety. Whether you?remore used to flying in an airliner or in a private jet, you may feel you?regetting more than your share of flight delays. It?s notjust you. xDelays are mountingas air traffic increases, particularly in the United States. A big part of the problemis that the U.S. air traffic control system is based on ground-based radartechnology that is increasingly incapable of handling the growing volume oftraffic ? particularly in bad weather. But new navigation, communication and display technologies being installed in the flight decks of today's airliners and business aircraft are helping solve the problem. These technologies help pilots fly their aircraft more efficiently and safely and help controllers keep flightson time. Radarsignals degrade over distance, so determination of an aircraft?s positionbecomes less reliable the further away it is. To preservesafety, controllers must keep aircraft well apart. The faster aircraftare flying, the further apart they must be kept. In radar-controlled areas, aircraftcruising at the same high altitude must be separated by 5 miles. Over oceans,where radar coverage doesn?t exist, aircraft at the same altitude are kept 50miles apart, said FAA spokesman Paul Takemoto. Bad weatherconditions exacerbate the problem and force controllers to increaseseparations. By 2025, U.S. passenger numbers will more than double from today?s 740 million. ?We need totransition from the ground-based radar system,? said Takemoto. ?It?s decadesold and it?s totally maxed out.? The FAA?s NextGeneration Air Transportation System (NextGen)will use satellite communications instead of radar. By 2020 all U.S. aircraft will be required to have equipment that uses the system. Acornerstone of NextGen will be a technology called automatic dependentsurveillance ? broadcast (ADS-B). Several times a second, every aircraft will digitallybroadcast information obtained from its transponder regarding position,altitude, direction of movement and the aircraft?s horizontal and vertical speed. ADS-B uses two different satellitenetworks. Each onboard unit determines the aircraft?s position extremelyaccurately using GPS satellite signals. Then it digitally broadcasts this andother information to telecommunications satellites to reach all other aircraftwithin 150 miles, as well as ground stations. Everyaircraft?s instrument displays will process ADS-B information and combine itwith overlays of terrain topography and weather conditions to produce detailedpictures of the surrounding airspace. At the airport, ADS-B will let aircraftsee and avoid each other on runways and taxiways. Air trafficcontrollers and pilots will be able to identify potential safety problems quicklyand avoid them. Using ADS-B, separations between aircraft can be reduced,airplanes will be able to fly more direct and efficient routes and the increasein U.S. air traffic will be accommodated. ADS-B isalready well-tested and has proved highly effective. In Alaska, wherecommunities rely on small aircraft for all their transport and supply needs,ADS-B has been adopted statewide. It has produced a 40 percent drop in Alaska?s traditionally high accident rate. UPS, apioneer in developing ADS-B, has fitted units to 300 of its jets so that whenthey converge on its Louisville, Ky. hub each evening they maintain optimumseparation and all can land on time. Hundreds ofoil rigs in the Gulf of Mexico are served by helicopters but are outside radarcontrol. The FAA and the Helicopter Association International are working toinstall ADS-B ground stations on rigs to improve safety. Meanwhile,advances in flight-deck instruments are making air travel safer and more reliable.The traffic alert and collision avoidance system (TCAS) and the enhanced groundproximity warning system (EGPWS) have become so invaluable that every country inthe developed world has now made these systems mandatory on its airliners, saidFlight Safety Foundation expert J.A. Donohue. TCAS uses anairliner?s transponder to show other aircraft in the vicinity information aboutits identity, position, speed and direction. The system alerts pilots ofaircraft nearby, warns them if another aircraft is within 30 seconds? flyingtime and advises a specific avoidance maneuver if a collision becomes likely. Two airlinerscollided over southern Germany on July 1, 2002. Authorities investigatingthe accident found that had the captain of one aircraft taken the avoidingaction his TCAS unit advised rather than following the controller?sinstruction, they wouldn?t have hit each other. One of theleading causes of airliner accidents is controlled flight into terrain (CFIT).This occurs when pilots aren?t aware their aircraft is closer to the groundthan it should be, usually in bad visibility. EGPWS ?which compares an aircraft?s GPS-derived position with a digital topographicmap to warn pilots when they are in danger of flying into terrain ? is soeffective that no aircraft fitted with it has ever had a CFIT accident, saidDonohue. Other newflight-deck technologies are reducing the numbers of delays and accidentscaused by bad weather. Modern weather radars give pilots a 20-mile offset viewthat shows them how high all the clouds are around the aircraft, allowingpilots to avoid strong convective formations. 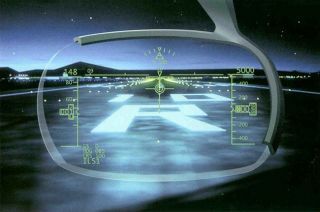 Enhancedvision systems use infra-red imaging to let pilots see the runway below atnight and in low cloud. Synthetic vision systems ? which use digital terraindatabases, like EGPWS ? help pilots complete landings in poor visibility. ?Basicallythe aircraft knows what it should be seeing and projects an image of what tolook for,? said Donohue. ?It enhances situational awareness when you finallyget through the clouds. ?